Tennessee freshman defensive back Alontae Taylor, right, covers junior receiver Marquez Callaway during the Vols' open practice Sunday afternoon at Neyland Stadium in Knoxville. KNOXVILLE — With Tennessee's lack of proven experience at cornerback, it seemed natural for coaches to give versatile freshman Alontae Taylor a chance to play the position during spring drills. Now it's evident why Taylor's move from wide receiver has extended into August. The former Coffee County Central all-purpose star intercepted a Jarret Guarantano pass during 11-on-11 work in front of several thousand fans Sunday afternoon during an open practice at Neyland Stadium. The Volunteers have not started working in full pads, and Sunday's practice was just the third of 25 before the Sept. 1 season opener against West Virginia. But Taylor's performance and his spot on the field working with veteran defensive playmakers during the 11-on-11 session demonstrated he has the potential to make an early impact. "When you look at trying to get the best guys on the field and creating the best team, we decided to start him out at cornerback," coach Jeremy Pruitt said last week. "I think that will create a lot of competition. He is a big guy who can play the ball, run and is instinctive. "We talked a lot about it and looked at him on both sides. We just thought the best place for him to start off this fall would be on defensive." Taylor is listed as both a defensive back and a wide receiver in the Vols' media guide. Soon after Taylor's interception, Guarantano threw his way again, and this time sophomore Josh Palmer caught the ball for a touchdown. It was one of few instances when Taylor was successfully picked on during the practice. Taylor also intercepted a Keller Chryst pass in an earlier drill pitting cornerbacks and receivers against each other. Junior tight end Dominick Wood-Anderson, a junior college transfer, flashed his playmaking ability early in practice with an acrobatic catch over the middle on a pass from Chryst. "Dom is a big man who has some ability," Pruitt said of the 6-foot-4, 257-pound former high school quarterback. "Obviously, he wasn't able to participate in the spring, so he's had two practices. Really, it's a different offense than what he probably played in junior college. So just the retention, learning how we're going to compete every day and all that." 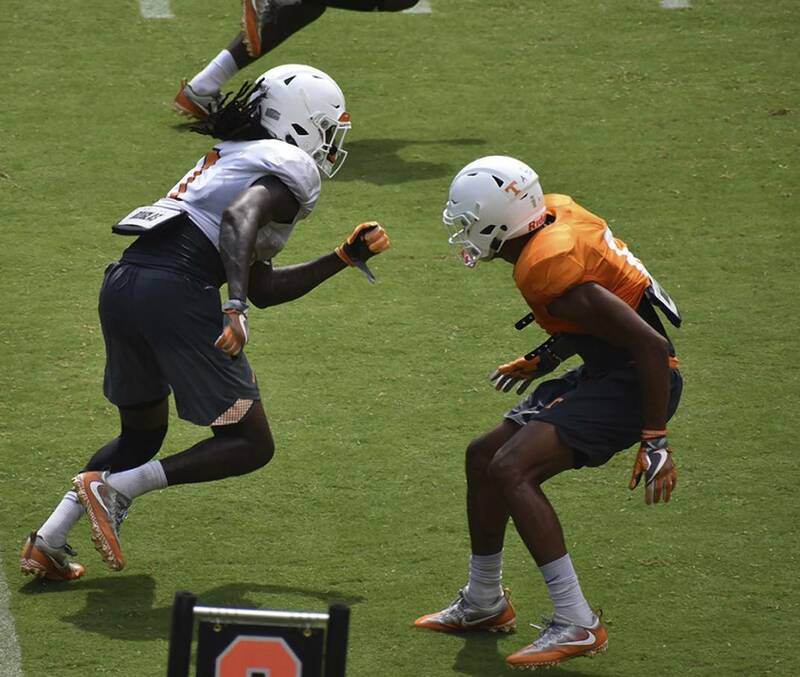 Sophomore receiver Jordan Murphy showed his potential with a diving touchdown catch in the back of the end zone on a pass thrown by Guarantano early in practice. Murphy had just one catch a year ago, but at 6-0 and 177 pounds, he looked capable of emerging as a threat out of the slot. Sophomore Maleik Gray worked at receiver for the second straight practice. A former four-star prospect from La Vergne High School in the mid-state area, Gray played in just two games as a safety last season. "Again, we're trying to figure out who our best players are, get them in a position to try and have success, try to create depth," Pruitt said. "Maleik is a guy that has size and has speed." Gray played outside linebacker and wide receiver in high school. Roughly 45 minutes into the open practice, which lasted more than two hours, a lone fan on the stadium's west end started shouting the words to "Rocky Top." His rendition bellowed throughout the stadium, and eventually many other fans joined him in singing.